208 Acres - $324,900 Double H Farm is a very nice farm with good hunting. Whether you are a farmer looking to expand your farming operation, a hobby farm owner, prepper, a hunter or someone who wants the luxury of having country living and wildlife, this property is for you. This farmstead is located just minutes from US-73 and is complete with a farmhouse, barn, large pole shed, and other outbuildings to run your farm operation. The grass fields can run around 20 cow/calf pairs with the large stands of cool season grasses along with clover for the wildlife. Ponds water the cattle and wildlife. With the endless food plot areas and hardwood timber, this a great hunting destination. If you are looking for country living, cattle operation, hunting and income potential, this is the property for you. Remember, buy land; theyâ&#x20AC;&#x2122;re not making it anymore. 400 Acres - $499,000 Beautiful Ozark mountain land with over 3/4 mile of gently flowing Little Beaver Creek frontage. Seventy-five percent of this property is in timber with the balance in bottom ground, river, creeks, trails, roads and grass. Great hunting overall with big bucks and long beards on this wildlife sanctuary. Some key features on property are the creek frontage, elevation changes and views of mountain tops for miles around. Don't miss this opportunity to own this farm! 203 Acres - $625,000 The Rock Hollow Ranch is a dream property with loads of character. This turnkey cattle operation will allow the new owner to produce a nice income from the property, all the while enjoying breathtaking views as he/she cruises the rolling pastures checking the herd. Previous owners have built and maintained an intensive grazing system to garner the maximum holding capacity per acre. Staying with the property is a nice sized cattle working area located atop a flat ridge for dry working and loading conditions. Also included are a large outdoor riding/roping arena and a 40 ft round pen, all in excellent condition. The 60 x 40 concrete floor barn with water and electric will also be a nice asset to the new owner. The beautiful western lodge-style earth home is a must see with top quality features, including an open beam main living area and kitchen with slate and plank flooring. The custom knotty elder cabinets feature large drawers and granite counters. Stainless commercial appliances include a designer sink, large stainless range hood, eight-burner gas range, double oven, etc. In addition, there is a whole house stereo system. The bathrooms feature granite carved vessel sinks and skylights. The front of the home features a fully covered porch overlooking a great yard with plenty of room for entertaining. Outbuildings include a 30 x 24 shop that has been converted into an apartment. Insulated, full bath, one bedroom, vaulted ceiling in living area, skylights, phone and cable. A three-sided enclosed carport also attached. A tall 50 x 32 RV garage has pull through doors for your RV. One room has been framed and covered, wired and plumbed for a bathroom and would serve well as a hunter's lodge. Five beautiful ponds, multiple streams, three waterfalls, and a cave. 672 Acres - $1,478,400 Three Bar Farm is truly the property of a lifetime, offering beauty and seclusion as well as a solid financial opportunity as an owner/operator, cash rent and land appreciation on pasture/bottom ground properties. It is located approximately 16 miles east of Marshfield in Southwest Missouri. The property consists of slightly rolling hillsides with level creek bottoms. Approximately 85% of the land is open with a quality stand of fescue and native clovers. The farm has a nice home, good fencing and cross-fencing, two corrals, working facilities, scales and several barns including hay barn and livestock barn. The live water creek runs along the entire property with approximately 3/4 mile of frontage and several holes where fish are found. Water consists of multiple ponds, creeks, springs and wells. Wildlife is abundant at the farm where the giant whitetail deer never have to leave the property with the bedding thickets, ridge tops and bottoms giving them amazing habitat. It is very rare to find a property that has this much huntability that only Mother Nature could create. Great road frontage making access a dream. Fenced into 20 pastures with three sets of pens. More land available. Give me a call to set up a private showing of this dream property. 368 Acres - $1,145,000 The Gasconade River Ranch is as rare as they come with million dollar views, cattle production to run over 100 head, trophy deer and turkey hunting and excellent access to the river, which is sure to provide hours of fishing, swimming, and canoeing enjoyment. From the moment you open the custom front door, you will be overwhelmed by the massive windows which allow for views of the river below and the beautiful Missouri Ozark Mountains. Professional stainless steel appliances and a well-designed work area will add to the pleasure of creating a culinary masterpiece all the while still being able to entertain guests and enjoy the amazing river views. The 1000 square foot master suite is designed around a single concept of pure relaxation and luxury including a sitting area, exercise room, and the continued amazing river views. The master bath offers a huge shower and a massive closet with built-ins. For your vehicles and small equipment, there is a large 3-bay attached garage and second garage on the back of the home. The finished basement area boasts one additional bedroom and a walk out covered patio. There are two additional baths, a large work room with an additional concrete 'bunker' safe room and a mechanical room, which houses the heating and cooling systems, water heaters and a host of other mechanical systems. Whether you are looking for an incredible river property, cattle production, hunting retreat or just a beautiful home in the country, this place has it all and is priced to sell. Donâ&#x20AC;&#x2122;t miss the opportunity to own this great South Central Missouri property. Call me direct for more information on this great property. Remember, buy land; they're not making it anymore. 7,000 Acres - $25,000,000 The Rubidoux Creek Ranch is a premiere large cattle operation. From the magnificent ridge top views overlooking the famed Rubidoux Creek to the hayfields and ponds, the ranch reflects the cattleman's vision and the American dream of large land ownership. This ranch can be purchased with owner financing at a competitive rate. All minerals will be conveyed. This is a turn-key sale with 1,785 head of cattle, equipment, and homes. Over 7,000 acres of cattle pasture. Live water to pastures with 2.5 miles of beautiful Rubidoux Creek on property, 50 ponds and 14 wells. Two sets of certified scales on ranch for shipping cattle. New 5 wire fencing on entire perimeter and crossfenced into 50 pastures for rotational grazing. 11 sets of working pens and fountains for ease of settling and shipping cattle. Good road system on entire ranch. 9 homes on property, some are being rented for cash flow. 7 hay barns, multiple shops and outbuildings. Houston, Missouri is 26 miles away. US-60 is 23 miles away. 240 Acres - $325,000 Priced to sell! Whispering Pine Farm is a very nice hunting farm with outstanding pasture ground. Whether you are a farmer looking to expand your farming operation, a hobby farm owner, a hunter or someone who wants the luxury of having country living and wildlife, this property is for you. This farmstead is located just minutes from area lakes and rivers and is complete with a NEW 1065 sq. ft. farmhouse, barn, large pole shed, and other outbuildings to run your farm operation. The grass fields can run over 24 cow/calf pairs with the large stands of cool season grasses along with clover for the wildlife. Multiple springs and ponds water the cattle and wildlife. Outstanding bottom ground for production also. With the endless food plot areas and hardwood timber, this is a great hunting destination. If you are looking for country living, cattle operation, hunting and income potential, this is the property for you. Property is secluded, scenic and priced to sell. Give me a call to see this turn-key property. 148 Acres - $575,000 This working cattle farm offers a solid income with cattle and hay production for the future owner. Water is abundant in all 9 pastures with a 1000' deep water well and four auto waterers. Farm has good soil and very gentle roll to it. With the 1890 historic farm home, this could be your future dream property. Property has great blacktop frontage and beautiful home site options for future development. When you say this farm has it all, it is an understatement. The property has the perfect location, being only minutes to Springfield, Republic or Table Rock Lake. Come experience the American dream of land ownership with this income producing property. This property has all you need to live your country dream. The layout of the property is perfectly centered around the stunning 4,300 square foot home built in 2004 that has been well maintained and has great views from both the front and back of the house. The kitchen has custom cabinets, an island and a rock wood stove. The timber frame architecture of the home is truly a masterpiece. The lighted horse arena is situated right next to the 5 stall horse barn for ease of operation and making many great memories. The land is made up of gently rolling pasture, wooded draws and flat ridge tops and also contains two springs and the James River for continuous fresh water supply. The property is fenced and crossed fenced with water provided to each pasture. All pastures have been limed and fertilized to soil test recommended levels in the past year, and both grasses and legumes have been drilled into all pastures. While the property itself is secluded, it is still close to all the comforts of city living. There are several small towns in the area and it is only 35 minutes from Springfield with several colleges including Missouri State University, a rapidly expanding hospital system and many restaurants and shopping. Call me today to schedule your very own private showing. Donâ&#x20AC;&#x2122;t miss the opportunity to own this great Southwest Missouri property. Newly remodeled condo in lakefront community. 2BR, 2BA lower unit with screened in sunroom. Both BRs & living room have access to the sunroom. Some lake view, 2 car carport plus additional guest parking. Association has a community pool. This is a must see unit! #60072840. $93,500. Call Sharon at 417-332-7254 for more info. Lake Front Acreage with private dock. This large home has it!! 4, possibly 5BRs, large open living/kitchen area. Walk out your back door to your own dock. Be sure to see this one!! #60036697. Call Jim at 417-230-2520 for more info. Amazing Panoramic Lake View Home!!! Lake views from practically every room in the home. 3BRs set up for each BR to have private BA. Open floor plan very livable for vacation or full time living. Decks - screened porch - grilling area - workshop - tennis court & a wonderful flower garden for those moments of reflection. Additional lake view lot available. #60064720. Call Jim at 417-230-2520 for more info. Newly remodeled 1BR Lake View condo!!! Located close to Table Rock Lake, it’s the perfect weekend get-a-way. Amenities include swimming pool & tennis courts. Just minutes away from all Branson attractions, shopping, & lake activities. #60073239. Call Jim at 417-230-2520 or Karla at 417-294-7680 for more info. Vacation & Investment! Opportunity awaits in lovely, fully furnished, turn key, LAKE FRONT with panoramic LAKE VIEW 2BR condo. Fantastic location! Great vacation setup. Covered lake facing deck & right next to the swimming pool. Watch the kids or grandkids at the pool, while sipping your favorite beverage on your deck! In a nightly rental program for extra income, when you are not using it. Close to grocery store, restaurants, marina, boat ramps, WalMart, & all the Branson area attractions! Better snag your Vacation Dream Condo, before this bargain unit is gone! #60056005. Only $128,000! Benny or “Hug” at 417-331-6247 or 417-860-7804. Looking for a Beautiful View? This is a must see home in Kimberling City just off Joe Bald Road. This home boasts a beautiful view of Table Rock Lake with the Kimberling City bridge situated in the view. A well maintained home & lawn with a spacious kitchen & dining room that walks out to the patio. Enjoy great summer evenings on the patio overlooking the lake. Other features of this home have a spacious living room, large laundry/utility room, 2 car garage, a large master BR & master BA. This home also includes the lot across the street which ensures the beautiful view for years to come. Other great features include an in ground sprinkler system by Rain Bird for the lawn, well maintained lawn & woodburning stove. Check out this home today. #60070093. Call David at 417-379-5995 for more info. Lake front with boat slip right behind home. Gradual slope. Lots of rooms for all kinds of usage. 2 fireplaces, large back deck, open kitchen/dining, family room. Close to Kimberling & services. Boat slip with lift available for extra $$. #60065460. $289,000. Call Gwen at 417-300-4347 for more info. Year-round view of Table Rock Lake. Double decks 10x24 & 12x24 plus 18x8 covered front porch. Large living room with corner fireplace. Hardwood floors in living, dining, kitchen & hallway. Knotty wood touches on ceilings in these areas. Knotty wood in kitchen & utility room cabinets. Nice wrap eating bar to accommodate 4 bar stools. #60067172. $169,900. Call Mary at 417-838-8286 for more info. Adorable upgraded home with a circle drive on a landscaped corner lot. Nice decor with mostly neutral colors. There is a 16x16 covered deck with an 8x8 off set. The rear yard is fenced, shaded & ready for entertaining. 2 car carport & 18x20 workshop with stove built in 2014. #60072568. $69,900. Call Mary at 417-838-8286 for more info. Exceptional Lake Front Home with a great open floor plan. Gentle slope to the lake with just a short golf cart ride to the slips. Perfect for a vacation home, full time living, or retirement home. 2 boat slips available for extra $$. #60063839. Call Jim at 417-230-2520 for more info. Looking for a Family Retreat that is located on the lake? This lake front home is close to all area attractions & Table Rock Lake activities. Home has been completely remodeled with 2 full kitchens, 2 living areas, 4BRs, 3 full BAs. Upstairs living area is also a lock-out unit. A 10x24 boat slip available for extra $$$ in nearby dock. #60073130. Call Jim at 417-2302520 or Karla at 417-294-7680 for more info. 10403 Branson L anding Blvd. 3 full bedrooms, huge walk-in closet, 3 full bathrooms with Jacuzzi tubs, tiled showers, 2 story with gorgeous staircase. Includes a Butler’s kitchen along with formal kitchen. Over 2100 Sq. Ft. of living and 2 car parking spaces in garage. Elevator access to both floors. Beautiful 1 bedroom 1.5 bath Luxury Spa Style Bathroom, Walk in closet, wood floors Access to 3 pools and more!! COMMERCIAL SPACE AVAILABLE FOR LEASE. Come join a variety of unique retailers at the Victorian Village. Great shopping destination for Branson visitors. Top Notch on Table Rock Lake! Come and see this first class lake front home. Offers 5 large bedrooms (2 Master Suites), 5 full baths, 3 living areas (one in the open loft area), Soaring ceilings, granite counters, gorgeous hardwood floors, laundry areas on the main level and basement level. Storm room. Custom patio and outdoor living spaces with picture perfect landscaping and a water fall. Just imagine sitting with your morning coffee listening to the water fall or enjoying a large gathering with family and friends at the lake house. Gentle slope to the water. Slip available on the community dock with great access. This home is spectacular, call Alex for a showing today. Lake Front on 3 acres high above the Kings River with Panoramic Views, 5BR, 4BA custom log home. RV barn & shop w/ separate septic & water. Open floor plan with a Large all purpose room, main floor master & lower level master with private bath. Radiant heated floors down & tons of other features. 3rd Party Boat Slip Available for $25k. #60024690. $375,000. Newly Constructed, Contemporary home on 3.5 acres with room for a garage. 3BR, 3BA, 1,512 sq ft, vaulted Red Cedar ceilings in living room, hand scraped wood floors & slate tile throughout. Granite countertops, spacious island, great for entertaining. French doors lead out onto the deck that wraps around to the bedroom. #60032701. $158,000. Wonderful 4BD,3BA lake home on 1.65 acre with shared pond thatâ&#x20AC;&#x2122;s a short walk to the neighborhood boat launch. Perfect for both indoor & outdoor living from the covered porch, gazebo, & large treed yard, to the open living, dining, & fully equipped kitchen. 2 car detached garage and a 1 car detached garage for boat storage & more. #60048371. $199,500. 3BD, 2BA, 3400+ sqft on 1 acre with lake views & SK Bridge. Boat garage, 2 car attached garage plus two storage buildings. Updated finishes plus the big and important updates are taken care of...new HVAC, Water Heater, Water Softener, all Appliances, bath fixtures, Electrical & exterior siding! All season sun room and tons more. #60053341. $289,000. Lake Front 3BR 2BA home has the original lake home charm & finishes. Entertain in the Huge screened porch & enjoy the lake views. Walkout lower level partially finished for added living space, basement garage & multi-tiered decks. Easy walk to the water right behind the house to INCLUDED 10x20 boat slip in walking distance. #60054065. $225,000. Lake Front home, Awesome floor plan for Lake lifestyle entertaining. 4BD, 2BA, 1,672 sq ft, two separate upper levels and split bedrooms provide comfort and privacy for guests. Screened in porch & outdoor deck, 2 car detached garage & 10x24 boat slip INCLUDED is just a golf cart ride away. Home comes furnished and on 0.58 acres. #60055253. $210,000. Private 2-slip dock, 14.24 m/l ac of gentle walk to the water lake frontage, Custom Built Home & 32x60 4-dr Morton garage/workshop. This private estate has it all! 4BD, 2.5BA, Open Beam, Vaulted Ceiling in spacious kitchen, living room, dining area, & wet bar. Main Floor Master Suite with gorgeous views. Huge lake side deck & screened-in porch. #60055921. $890,000. Updated & Move in ready! Secluded home close to the lake. 3BD, 2BA, 1,995 sq ft. Large bedrooms and walk-in closets provide plenty of room for everyone. A great updated kitchen and dining room with access to the back deck. Finished basement with a family room and large walk out utility room. A must see and a great way to get near the lake! #60058608. $129,900. THE VIEW! THE VIEW! Lakefront home with awesome panoramic view across the lake. 2BD, 2BA with open living, dining floor plan that flows out to lots of outdoor living space on the wrap around decks. 2 car garage plus additional garage for all of the toys. Home has a whole house generator & is a short distance to the boat launch! #60066960. $199,999. Great 3BD, 1BA lake home with gorgeous lake view from the large screened in porch and just minutes to Campbell Point Marina & boat launch. Updated kitchen, living rm, & Cozy family room with freestanding pellet stove plus a bonus room that has multiple uses. Awesome shop/ garage and an additional garden shed for extra storage! Shop includes a built-in shop vac and air compressor as well as tons of built-ins. #60067678. $74,900. Beautifully Updated Lake Home boasting a Panoramic view of Table Rock Lake and the 39 Bridge just a golf cart ride to the boat slip. There are 2 levels of living. 3BD, 2BA, plus laundry on the main level. The lower level has a family room, full bath, all purpose room and a 2 car garage. There is a wonderful patio just off the kitchen and a firepit with a lakeview to enjoy around the fire. A MUST SEE! #60072452. $239,000. LAKEFRONT NEAR CAMPBELL POINT MARINA! Boat slip included. Panoramic views in this 3BR, 3BA, 3,084 sq. ft., fresh paint, updated kitchen with granite, stainless steel appliances & flooring. Open floor plan, 2 levels of living, tons of storage, plus easy to maintain landscaping & outdoor space for entertaining. Home warranty included. $345,000. Nonna’s Nummies Great Investment Opportunity Near Table Rock Lake and is a Town Favorite! Fully Equipped, Turn Key Restaurant with Updated 3BR Home on Site. Current Owners have fine tuned the Business Plan for you! Beautiful landscaping, Large Paved Parking Lot with inviting Curb appeal. Sales Up last 2 years! #30358695. $349,900. Prime location, versatile commercial building. Over 7500 sq. ft. of retail & warehouse space with upper & lower level access. Warehouse with drive in garage entrance & loading docks. Road access from front and back, ample office, showroom, and storage space. Extremely useful space for a number of industries or the ultimate hobby shop! #60044547. $249,900. Fantastic Investment Opportunity on Beautiful Table Rock Lake. A Shell Knob ‘’water’’mark. Full Service Restaurant, Profitable & Turn-key, in prime location next to brand new Campbell Point marina, Seating for 150+, parking for 21 boats, lots of new equipment, PLUS priced below appraised value with room for growth and expansion. #60057973. $429,000. GREAT OPPORTUNITY TO START A FANTASTIC LOCAL BUSINESS! Farmer’s Daughter Floral & Greenhouse was Shell Knob’s Florist with beautiful retail areas & efficient workspace, custom built with attention to every detail. Built with versatility in a floor plan designed to be easily converted to 2BR, 2BA home. State of the art propane radiant floor heat system as well as efficient central air. #60064468. $159,000. Nestled among the Ozark Mountains with Table Rock Lake Views sits this Multiple Unit High-Rise in the heart of town close to conveniences. This 35 unit with 60+ beds. Fully equipped commercial kitchen, lobby, managers quarters, office, 3 conference/dining rms. Private well, swimming pool, elevator, partially furnished and both central & individual HVAC. Large shop/garage. #60068208. $1,399,000. Start your own business in the popular Lake town of Shell Knob. 1200sq feet of retail space and another 1200sq feet of living space in the basement area. The full apartment allows you the option of living below your retail business, talk about saving cash ... This is a great opportunity. You really need to take a look at this gem! #60071894. $69,000. 2.68 ACRES! This lot sits among some of 2.92 ACRES! Great location! Don’t 1.76 ACRES! Gentle sloping & partially BUILD YOUR HOME HERE with a Kimberling City’s most beautiful homes. Lot miss out! Lot 7, Plateau Lane. cleared to enhance the incredible view. view of beautiful Table Rock Lake. 6, Plateau Lane. #30350816. $125,000. Table Rock Lake. #30350822. $75,000. #30350818. $100,000. #60036706. $24,900. 0.67 ACRES. Built your private retreat 3.5 ACRES. Great level buildGREAT LOCATION TO BUILD on NEW PAVED ROAD with a view of on this secluded lot. Enjoy Table Rock ing acreage on Table Rock Lake. #60056776. $59,500. Table Rock Lake. #60031474. $12,500. Table Rock Lake. #60031481. $12,500. Lake! #60019809. $18,000. VERY WELL MAINTAINED OLDER HOME located close to schools & town. Original hard wood floors, large bedrooms, formal dining room, storage shed and garage all on a corner fenced-in lot. Would make a great starter home or rental! #60060292. $43,900. GREAT STARTER LAKE HOME located in Sweetwater Beach. Nice open floor plan with wood accents throughout. Two large bedrooms with large closets & a 30x30 garage with an oversized 10 foot door. All appliances stay & house is move-in ready. Third lot includes all improvements in place. 2.29 acres of wooded bliss, very low maintenance yard & home! #60045673. $154,900. NEW CONSTRUCTION in a nice subdivision on the outskirts of Cassville. 3 bedroom, 2 baths, 1,169 sq. ft. Makes a great starter home or for someone downsizing. #60073350. $104,900. GREAT HOME WITH ALL THE AMENITIES YOU WOULD WANT! Large open floor plan with wood burning fireplace! Spacious master bedroom & bathroom. Upstairs had a mini-kitchen at one time, plumbing still in place. Very usable acreage for cattle, horses, garden/ farming. Very close to town of Eureka Springs, Table Rock Lake & all amenities. #60070762. $199,900. LAKEFRONT, LAKEVIEW, BOATSLIP BEHIND HOME! This is it! Large living room opened to kitchen/dining room. Leaving completely furnished. Bring your toothbrush & enjoy the lake! Both overlooking the lake & your 10x30 boat slip! Basement has a room used for a third BR for guests. New HVAC, newly remodeled BA, handicap ramp & a small storage building. Boat slip additional $30,000. #60073316. $199,900. BEAUTIFUL TIMBER FRAME HOME that borders Cassville Golf Course, minutes from Roaring River State Park & boasts 26.8 level acres. Main level features large kitchen, formal dining room, sun room & sunken in living room. Rich wood accents & trusses throughout the entire main & upper levels. Lower level is comfortable & roomy with large living area, BR, BA & bar area. Upper level has 2 large cathedral ceiling BRs & a jack & jill BA. Tons of storage throughout the home, extra large pantry & laundry area off the attached 952 sq. ft. garage. Owners added a 40x40 steel framed insulated garage with 10 ft. doors in 2004. Don’t miss this one! #60055858. $569,000. DON’T MISS OUT ON THIS FARM! Beautifully built family home with 103 acres overlooking Ozark mountains! Custom built Knotty Alder cabinets, granite counter tops, hardwood floors. Master BR located on the main floor, includes walk in shower with 2 shower heads, built in vanity & a large walk in closet. Basement level includes 2 large BRs with walk in closets, large laundry room, storage closet with an indoor bladder tank for the well. Large living area for kids to enjoy & a fireplace that has been ducted throughout the home. Very efficient home!! #60068186. $330,000. JUST CAN’T BEAT THE LOCATION OF THESE LOTS! Schools around the corner, shopping close by. Each lot is nearly an acre (some more). City sewer, water & electric to each lot. Many to choose from, come pick yours today! #60057984. $19,900. LAKEFRONT, LAKE VIEW, SANDY BEACH & RED ZONED FOR DOCKS. This is such a unique property & a must see. Fenced around the perimeter with 2 gates & several trails. Investment opportunity to subdivide or to build your very own estate. Up to three docks allowed. #60049640. $725,000. 3BR, 2BA HOME. Coachlight is a 55+ Community with full access to clubhouse & pool!!! #60057880. $23,000. 3BR, 2BA, 1,800 SQ. FT. HOME ON 0.76 ACRES. On a flat lot located near Baxter Marina. #60062249. $149,900. LAND, LAND, LAND. 77 acres. Build your dream home on the back half & overlook Little Cow Creek, Table Rock Lake!! Front half has great commercial opportunity with hwy. frontage!!! 60069466. $324,000. COOL WATER COVE. 4BR, 3BA, beautiful home sits on 2.6 acres lakefront!!! Boat slip available for extra $$ #60071049. $485,000. BEAUTIFUL LAKEVIEW HOME. 3BR, 3BA granite counter tops, vaulted ceiling, fireplace, turn key, ready to move in!! #60071711. $324,000. 2.1 ACRES. 3BR, 2BA home, edge of Galena. #60065358. $89,500. Beautiful, one-of-a-kind home with many, many extras. Large open kitchen & great room with breakfast bar. Formal dining & insulated floors complemented with gorgeous Brazilian hardwood floors. Oversize garage with 12 foot ceiling with storage. Two separate furnaces & air conditioners. Whole house voltage protector & Generator with transfer switch. 23’x44’ ‘’L’’ shaped deck. Two shops; one 40x50 15 foot walls, concrete heated floor with 14x14 power overhead door. Floor hoist & overhead hoist, air conditioned & heated with office/bar & 1/2 bath. 30x40 shop with 14’ walls. Two propane tanks, one 1000 gallon owned & 500 gallon leased. Many more extras, must see to appreciate all the extras. #60069834. $465,000. This Property sits on the west side of FR 1250 across from the 3.5 acres & house. Taxes & Title work separated these two parcels at closing of the house. Wooded area, but drive down FR 1250 to see what great views you will have when the wooded area is cleared...there’s 2-3 houses under construction on East Side of FR 1250 where they have done a lot of clearing. #60058928. $27,000. This is a quiet & peaceful acreage with a double car 24x24 attached garage & a 24x24 detached garage to store all lake toys. 10x24 boat slip priced at $30,000 sold separately, no commission paid on slip. This property has a hot tub in a sun roof with spacious deck. Newly replaced garage door on attached garage. This is a nice surprise...Come see & appreciate it’s potential.....#60073905. $262,344. Lots of beautiful Oak & Walnut Trees that can be sold. Once cleared for building your lake dream home...you have a gorgeous view of the lake. This is a gentle slope with a flat high ridge, perfect for building on...& you’ll have a million dollar view of Table Rock Lake. 10x28 slip sold separately for $28,000. This is a property you will fall in love with..... come see what we mean.....#60035535. $329,000. This is a great lake home with detached garage & nice wrap around deck on the lakeside 36’x44’x36. Walkout finished basement area with lots of storage. Open floor plan with kitchen eat-in bar. 10x24 slip & lift available for $35,000. extra. Home has pocket doors in couple of rooms. #60074083. $264,995. Property has Road Easement for access to land. Sign is placed on the corner at the road easement access to property., Directions From 86 and 13, go south towards Blue Eye, at EE turn east and go about 3 miles to Sign on Fence. #60053711. $72,000. Excellent land for development. How about a Hotel, would be the first hotel entering into the Hollister, Branson area...just off the Airport road. 600 foot of frontage on highway 265 & also overlooks highway 65 frontage just south of highway 265 on right. Stone House & 2.6 acres adjacent to this property. Not listed but buyers might want a 2400 square farm home to go with the 24 acres. #60044324. $675,000. Located in Thousand Hills, this beautiful well appointed and fully furnished condo features master bedroom suite, guest bedroom, 2 baths and great sunroom. Priced to sell at $129,900. MLS#60068346. LOCATION, LOCATION, LOCATION Thatâ&#x20AC;&#x2122;s what they say about this darling home right in the heart of Branson. Pretty and neat as a pin and priced at only $89,900. MLS#60072532. This spacious and newly redecorated home features a large living room, family room, 3 bedrooms and 2 baths with a nice kitchen. Also included is huge bonus area that could be used for a home based business. Well located just off main highway for easy access. Price to sell at $145,000. MLS#600725684. This pretty home is cozy with unique dĂŠcor and lots of extra space. Property includes home and two rentals with a bee keeping business available as well as large garage and workshop. Come see this property in the spring with beautiful flowers and shrubs. Priced at $199,900. MLS#60071813. This large building has recently been a auction house and was once a flea market. It could have a variety of uses with large garage doors and office space. Included is 12 bay storage units. Priced at $175,000 for everything. MLS#600737654. 3 Bedroom, 2 Bathroom, 2 Car Garage, 1,200 Sq. Ft. $119,900! Sign A Contract In April & Beat May’s Price Increase! 3 Bedroom, 2 Bathroom, 2 Car Garage, 1,522 Sq. Ft. Unfinished Basement. $179,900! 3 Bedroom, 2 Bathroom, 2 Car Garage, 1,522 Sq. Ft. $144,900! Unbeatable Value With Our Site-Built Homes! 3 Bedroom, 2 Bathroom, 2 Car Garage, 1,543 Sq. Ft. $189,900! 3 Bedroom, 2 Bathroom, 2 Car Garage, 2,002 Sq. Ft., Unfinished Basement. $224,900! 3 Bedroom, 2 Bathroom, 2 Car Garage, 1,759 Sq. Ft. $289,900! Residential & Commercial Pest Control Services High-Tech Service offers Pest Control services to the Lakes Region of Arkansas and Missouri. • Licensed and Bonded in AR and MO • Serving Homes, Businesses and Boat Docks • Service Plans to Meet Your Needs • Customized Client Checklist • Controls Spiders, Ants, Wasps, Mice and Much More • Repels Deer, Birds, Armadillos and Snakes • No Contract Required • Serving Our Customers Since 1972 Brown recluse spiders occur in the central and southeastern United States, especially in Arkansas, Oklahoma and Missouri. The spider can live for two years or more and because of its habit of taking up refuge in homes and its ability to survive up to six months without food or water, it is possible that they are being transported long distances. Arkansas is at the center of the species’ natural distribution, and this spider is common in both urban and rural settings. Opportunities for contact with it abound. Indoors, the spiders are often found in boxes, among papers, in folds of clothing, and in bedrooms, bathrooms, cellars, and attics. They tend to prefer dry locations that remain undisturbed, such as closets, attics and garages. Outdoors, the spiders are found under rocks, logs, or loose bark in relatively dry areas, such as under rock ledges. Brown recluse spiders are commonly active at night, when they hunt for insect prey. Because of their nocturnal habits, they are rarely seen. They will feed on many kinds of arthropods. The spider builds an irregular, mid-sized web of sticky silk, and often constructs a retreat of loose silk somewhere in the web. Webs are not particularly important for prey capture, and the species is an active hunter. Winter retreats outdoors are tubes of thick silk. Females produce up to five egg sacs containing 300-450 eggs. First aid for someone who has been bitten by a brown recluse spider includes use of an ice pack to prevent or reduce swelling on the area where the bite occurred. Cooling the area helps to lessen tissue damage. Also, sanitizing the area with hydrogen peroxide or alcohol helps to prevent infection. Promptly seek medical attention. If the spider can be found, it should be collected and taken with the patient to confirm the identity of the spider involved. The bite of the brown recluse is certainly a serious condition and hospitalization of the victim may be required. Those in poor general physical condition, young children, and older people are more apt to be affected seriously by the bite of the brown recluse. Brown Recluse are found in 8 out of 10 homes and business in our area. Call today for free inspections & estimates! The Premiere Gated Community on Beautiful Table Rock Lake offers you a Wisconsin Log Estate on 3 acres. The floor to ceiling stacked stone fireplace adds drama to the great room/dining room. Large dramatic arched windows allows the outside in. The master suite combines 4 rooms to escape to. Relax in the old fashioned claw foot tub and stand up shower encased in glass blocks. The master bedroom area combines drywall and knotty pine walls with log beams. The gourmet kitchen makes entertaining a dream, a Chef ’s delight! Hickory cabinets, Corian countertops, tile flooring, along with top of the line appliances. The 5 guest bedrooms feature their own ensuites. Main level octagon shaped sunroom is where everyone gathers overlooking the in ground pool and Table Rock Views! Finished walk out level for entertaining. 2 boat slips available on site for additional $50,000. #60025352. $1,275,000. Amazing new Lake Front and Panoramic Lake View lots! Exclusive 10 lot subdivision has a unique setting which offers “Big Water Main Channel Views” from every lot. On site access to 12 stall concrete dock with 12x30 slips available for $35,000. Central sewer, state approved well, black top roads in subdivision. Lots range in size from 0.48 up to 1 acre. Prices start at $90,000. 4-1/2 miles from Hwy. 13 or Harter House in Kimberling City. Directions: Hwy. 13 to James River/Joe Bald Road. Continue on Joe Bald Road to Little Aunts Creek Road (Table Rock Health Care), right to Overlook - signs on lots to left. • 26+/- Acres with endless opportunity. Bus. 13. Not in city, county!! $39,900. #60065997. • Cedar Meadows. Branson Lake View. 3.24 Acres. $42,495. #60039239. • Branson Creek, on the Back 9 of Buffalo Ridge Golf Course. $52,495. #60039253. • 26 Acres, just minutes to Table Rock Lake. $54,500. #60053772. Bluff .4 acre lot for your cabin or home. $4,999. #60054329. Unbelievable Table Rock Lake View!! Listings are low. Give us a call if you are thinking of buying or selling! Our market is heating up and picking up! • 1.3 Acre Lake Front, Lake View on Long Creek, just 1/2 mile to Long Creek Marina. Just 1/2 mile of Hwy. 86 makes for an easy commute. Onsite soil and sewage evaluation complete. $229,900. #60064965. • Hwy. 86 Corridor!! 5.37 Acres in Stone County just past Taney County line. Almost impossible to find a large parcel with Lake View in this area! 12 platted lots or keep what you want and sell the rest. 2,100 ft. road frontage fro your custom lake property fence and gate!! $110,000. #60028182. • 6.33 Acres Hwy. 13 North of Branson West. $150,000. #60049423. • 1 Acre +/-. Bull Shoals Lake. $6,800. #60065703. • 1.5 Acre lot in Buttonwood, Kimberling City. City water. $7,800. #60020756. • 1 Acre +/- on Busy Hwy. 13. Need Shop? $29,895. #60028191. • 5.13 Acres on quiet street in Lampe. $32,500. #60053759. Level to sloping corner lot with underground utilities & community water. Boat slip available just down the street. $49,900. #60058897.
tABLE rOCK lAKE lAKESIDE cOMMUNITY OF lOST aCRES. Brand new, Table Rock Lake front condominium community 1st of 10. YEAR ROUND LAKE VIEW. Unsurpassed quality of construction. Builder paid attention to the details! Open and spacious, 4 bedroom, 3 bathroom. Solid wood doors and trim, hardwood floors, granite counter tops, stainless appliances, walk-in shower in master bedroom, custom ceilings, beautiful wood decking...and on and on and on. Gentle to water, located on the Ance Creek arm of Table Rock Lake. Reeds Spring School District. Minutes to community services: shopping, churches, etc. All inclusive condo association: cable TV, inter net, trash, water, sewer, garbage, common area maintenance and more! The convenience of city living ON Table Rock Lake. Full time or vacation home...come and enjoy Table Rock Lake!!! $349,900. #60054023. In the beautiful Cow Creek Area with YEAR ROUND LAKE VIEW! 4 Bedroom, 3 Bathroom, Walk-Out with Living room and Intimate den. Upper and Lower Decks, Attached 2 Car Garage. Wonderful LAKE HOME, Perfect for everyday living or Vacation Home. Priced to sell at $137,500. #60053082. Just minutes to Table Rock Lake. 1 car garage. $113,400. #60072334. Over 5 Acres With Affordable 3BR, 2BA! 3 or 4 bedroom with Sunroom off master. Living/ dining combo, family room/ den or could be 4th bedroom, 2 bath, brick home on 1 acre above the City Square of Galena. Brand new laminate flooring in living/ dining, 3 bed & hall w/ceramic tile in baths, kitchen & den. Storage galore with an abundance of closets and cabinets. Mature trees, just enough for shade on level homesite rolling off into woods behind. Wildlife often!! 3 year new roof, 5 year new water heater with City water & sewer! 2 car garage with one car opening allows for huge work area in garage. Breezeway connects home to garage. Priced to sell $114,900 #60069068. Brand New Luxury Condominiums - 2, 3 and 4 Bedrooms with Table Rock Lake Views, just minutes to Silver Dollar City. Nightly Rental Approved. Open and Spacious Floor plans, 9’ Ceilings, Custom Hardwood Cabinets, Private Decks offer Panoramic Views. Year Round Amenities – Indoor/Outdoor Pools and Splash Pads, Private Gym, Clubhouse, Owner’s Lounge, Boat/RV Parking. Elevator provides Easy Access to All Levels. Starting at $173,000. Call TODAY for more information. High end furnishing, on nightly rental program with bookings, too! Full time living or use as vacation home with an income!! Very close to Silver Dollar City off Indian Point Road. Includes membership to clubhouse and indoor pool. 39-5 $115,000. Updated 2BR, 2BA upper unit overlooking Table Rock Lake At Lantern Bay. 2BR, 2BA. Split floor plan. Fresh paint, newer appliances, fireplace, lakeview. $82,500. #60062025. Port Holiday On Table Rock Lake! This spacious first level condo features 2 Master Suites, 3 full baths, eat-in-kitchen, formal dining area, very large laundry room with full size washer & dryer. You can watch the sun rise over the Chateau and set over the Kimberling City Bridge from two covered decks. Enjoy the Pool, Club/meeting room, Hot Tub, and Exercise Room. A 3rd Party Boat Slip is available for additional $$. MLS#60061908 $179,900. april 7th, 3:00-6:00 p.m. April 8th & 29th, 1:00-4:00 p.m.
April 22nd, 1:00-4:00 p.m. April 28th, 3:00-6:00 p.m. Welcome to Del-Mar Estates in Hollister, Missouri. Conveniently located just minutes from downtown Hollister and Hollister Public Schools. Close to the Highway 65 corridor with easy access to shopping, schools, and to the vacation and entertainment mecca of Branson, Missouri where you will find both live entertainment venues and family attractions like Silver Dollar City. Del-Mar Estates features affordable, economical, and energy efficient family homes. Three bedrooms, two bathrooms, and a two car garage homes start in the $130’s with unfinished, walk out basement sites available. Better hurry, there are only two homes left at Del-Mar Estates! Welcome to Oak Brook Estates in Walnut Shade, Missouri. Set in the Ozark mountains just north of the vacation and entertainment mecca of Branson, Missouri where you will find both live entertainment venues and family attractions like Silver Dollar City. Conveniently located with easy access to the Highway 65 corridor allowing easy travel to the Branson metro area as well as the Ozark, Nixa, and Springfield, Missouri metros. Oak Brook Estates offers large lots up to ½ acre with homes starting the $190’s that include unfinished, walk out basements. Open house Welcome to Mill Creek in the beautiful Ozark Mountains just a short 10 minute drive north of the entertainment mecca of Branson, Missouri where you will find both live entertainment venues and family attractions like Silver Dollar City. Mill Creek defines “city close, but country quiet” with all Branson schools within a 10 minute drive, shopping at Branson Hills just a few minutes away, and convenient access to highway 65 corridor. Upscale home design with affordable pricing make Mill Creek a fantastic neighborhood for everyone. Homes in Mill Creek start in the low $200’s! April 15th & 22nd 1:00 p.m. - 4:00 p.m.
April 8th & 9th 1:00-4:00 p.m. Right HOUSE. Right PRICE. Right NOW. Panoramic Views! Owner Must Sell Fast! Don’t Miss This Incredible Opportunity!! Phase V, Lot #84. Lot Size: 102’x270’. Great View From The Front & Back Of Lot. Owner Purchased For Top Dollar. Contact Owner With Best Price! For More Information, Call Gary Conrad At 480-895-2468. To view current magazine ads, visit our website! See thousands of listings, all at the click of a button! 3.15 Acres Private waterfront building site on Bull Shoals less than 10 minutes from Branson. Stunning views of Bull Shoals Lake. 5.28 Acres. Great building site made up of two parcels just up the road from K Dock and very near Bull Shoals Lake. 29.05 Acres With 2BR, 4BA, all brick home nestled in peaceful, quiet area. Plus guest house/game room with sleeping quarters and bath. Could be two living quarters. Well maintained. Looks like new. Approximately 15.0 acres hay ground on bottomland. Three creeks running through the property. Call Dean or Gary. Enjoy the lakeview from deck or screened in deck. Immaculate four bedroom four and half bath lake home. Located at the end of the road in a nice area. Well-kept hardwood floors along with some carpet and tile. Lower level is perfect for guest. Large Family room and master bedroom with bath. Also has a two car garage, workshop an office or craft room. 1081.92 Acres with awesome panoramic views of Bull Shoals Lake from very large patio. The perfect place for an amazing get-a-way. Unique Spanish Waterfront Home with in ground pool. Open kitchen, dining and family room with fireplace. Four bedrooms, four baths and three fireplaces. Will enjoy the fishing cabin. Very close to the lake. Also, has a Barn with corral for cattle. The Mill House Family Compound with adjoining guest house and Bluff House is nestled in a wooded area on a bluff. It overlooks Capp's Creek merging into Shoal Creek, Cody Creek, Mill Pond and Dam, private park and old Grist Mill. Total of 18,000 sq. ft. of structure, 9 Bedrooms with Baths and 3 kitchens, 5 wood burning fireplaces, indoor swimming pool and 10 garage spaces. Wireless internet. Satellite TV. State stocked fishing (trout), lots of clear running water, 720 acre Hunting Preserve adjacent, Golf 7 miles, Executive Airport only 4 miles away. 2,000+ miles of great countryside driving. Rural and peaceful area (no traffic). Call Gary for details. Gentle Walk to Water. Awesome views of Table Rock Lake. Community amenities include underground utilities, clubhouse, saltwater pool & gated entrance. Boat slip available. Frank Lloyd Wright Style home plans with encircle drive go with the lot. Call Gary. 67.10 Acres. Peaceful quiet area. Boat Slip available. 196 Acre Lake Front Peninsula on Table Rock Lake. Awesome views! James River frontage on the East side. Hosted: Trace Adkins, Tim McGraw, Lynyrd Skynyrd and Journey. 6,000 seat Amphitheater with 3,000 general admission. VIP Pavilion. Five dressing rooms below stage for entertainers. Three concession buildings. New Pavilion built in 2011. Formerly was the Swiss Villa Amphitheater and has been around for a long time. It has hosted many great concerts. Approximately 47.76 acres. 30.0 Acres Hwy. 13 Frontage. Just 10 minutes to Table Rock Lake. Only 15 minutes to Branson, MO. New Hardees across the street. Ideal location for any commercial venture, shopping center, strip center, etc. Seller will divide. Approximately 50% of the property cleared, 50% wooded. City water and sewer on property. Bransonâ&#x20AC;&#x2122;s largest outdoor concert venue! Two bedroom country home with open kitchen dining area. Detached 2 vehicle garage/workshop 30'x34'and 27'x30' with 2 10' doors, several other outbuildings and corrals. Nice rolling to level with some bottomland. At least a dozen ponds scattered throughout. This beautiful 3 BR and 2.5 Bath home features an open floor plan with a brick fireplace. The lower level open family room is perfect for entertaining. New roof and updates. County paved road frontage. This property is perfect for pets, horses, and farm animals. This six unit apartment building is in the heart of Kimber ling City and is one block East of Missouri State Highway 13 and within walking distance of Table Rock Lake. All units either have balconies or patios. Parking is available in the front and on one side. Large trees shelter the back and sides of the building. These apartments are con veniently located near shopping, restaurants, medical, and may other services. Their location is an easy drive to the Branson area jobs and entertainment. The Reeds Spring Schools system provide excellent facilities. Many churches are located in the community. Beautiful country side views in peaceful setting! 5 Acres with a Panoramic View! Country living at it’s best! 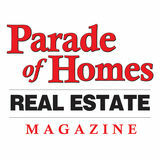 REAL ESTATE magazine to iS tSpr ho he iNg Me tiM Sh e op ! 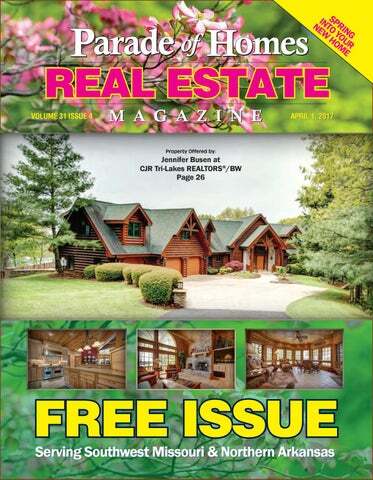 For a one year subscription, send $20.00 to: 8796 State Hwy. 165, Hollister, MO 65672 Name:____________________________________________ Address:___________________________________________ City/State/Zip:______________________________________ Email:____________________________________________ Phone:____________________________________________ Credit Card: q q q Credit Card #:______________________________________ Expiration Date:____________________________________ 3 Digit Code On Back:_______________________________ Name On Card:_____________________________________ Please allow 4-6 weeks for delivery of your first subscription. Log Sided 4,000 Sq. Ft. Lakehouse With Boatslip Included! This is about as big as you can get! 15 Lakefront acres with cabin near Big Cedar Lodge! Perfect spot to build your dream home or develop. One-of-a-kind property with monster lakeviews! 1,280’ of lake frontage. $1,400,000 #60071940 FANTASTIC LAKEVIEWS FROM THE MOMENT YOU WALK IN THE FRONT DOOR OF THE DELIGHTFUL HOME LOCATED IN THE LUXURIOUS GATED COMMUNITY OF eMERALD pOINTE! Enjoy One Of the prettiest views on table rock lake! Exclusive 43-Acre Lakefront Estate With Private 2-Stall Dock! Lakefront old-world estate with Tuscan inspiration! No expense or detail has been spared on this luxurious one of a kind estate with private boat dock! looking for luxury on the lake? timber frame lodge w/ private dock! Charming Cypress Log home Nestled on 48 Acres! Frank Lloyd Wright Style Lake View Home On 4 Private Acres! Branson 5 Bedroom, 5 Bath With Cape Cod Flair! HGTV Complete Remodel By Tom Caruso! Quiet Gated Community with Beautiful Scenic Views Located Minutes from All Branson Schools and Attractions. All offers will be considered! Pristine, ready to move in, great neighborhood, private, nature lovers view. Take a look, many possibilities!! Solid wood doors, large dine in kitchen with lots of storage, all appliances & pellet stove in the basement stay. Cabinets have pull out shelves & handy island. 2x6 insulated outside walls, custom molding. Numerous electrical outlets throughout the house. Covered porch & decks. Has never had pets or smokers. #60069681. $147,000 Call Don. Table Rock Lake, spanning more than 43 to 52 thousand acres (depending on water level) and 800 miles of shoreline, has become a perennial favorite vacation spot for campers, pleasure boaters, fishermen and lovers of water sports of all kinds. Located in the beautiful Ozark Mountain Country of southwestern Missouri, Table Rock Lake is situated near one of the nationâ&#x20AC;&#x2122;s most popular entertainment and leisure destinations, Branson, Missouri. Table Rock Lake was created in August of 1958, when the U.S. Army Corps of Engineers built Table Rock Dam across the White River. Construction had begun in October of 1954 and by June of 1959 hydro-electric power was being distributed to the Ozarks. The area had already established itself as a prime fishing and recreation area as far back as the 1930s, but needed protection from devastating floods on the White River. Beneath the dam, the Missouri Department of Conservation operates a fish hatchery, which is used to stock trout in Lake Taneycomo. Living, Loving & Selling Table Rock Lake & The Ozarks. Lake Front Resort situated on 4 acres. See more of my ads on Page 5 of this issue.